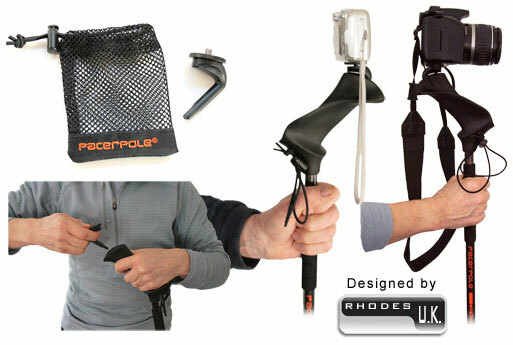 The Pacerpole Camera Mount turns either a Left or a Right Pacerpole into a monopod (suitable for Pacerpoles produced after October 2005). The insert hole ends in a chisel shape; when the end of the camera mount locates this slot it can't rotate. The camera mount is a moulded plastic unit with a stainless steel whitworth thread and high grade alloy knurled nut. It weighs approx 18gms and comes with a mesh storage bag. 1. Lever-out the top plug with a strong thumb nail (or equivalent). This will ease after several uses. 2. Use a direct push-in or pull-out action without twisting. 3. It is a firm fit - try moistening (preferably a smear of Vaseline) to make initial insertions easier. Windermere from Gummers How, Lake District, UK. Taken using the Pacerpole Camera Mount.